DOVER, NJ, September 18, 2018 - Casio America, Inc. a leading innovator in the world of electronic musical instrument technology, encourages musicians of all styles to celebrate National Piano Month this September. Whether you play funky beats or classical standards, Casio’s expansive portfolio of digital pianos include models with features and benefits to suit your style. For the classic piano player, Casio’s CELVIANO Grand Hybrid GP-500 recreates a traditional piano experience through the convergence of acoustic and digital technologies. The GP-500 utilizes the AiR Grand Sound Source, which faithfully recreates the same sound and reverberation like that of a grand piano, and a Grand Acoustic System that generates a space of three-dimensional sound and represents the sound of a grand piano as it emanates from above and below the soundboard. Exclusive and innovative technology reproduces the subtle nuances of the world’s finest grand pianos and allows players to enjoy the comforts of traditional pianos with key technological advancements. Its Natural Grand Hammer Action Keyboard technology includes full-length piano keys that use the same materials and processes as in C. Bechstein grand pianos and conveys delicate finger nuances more accurately, while enabling dynamic touch which allows the pianist to play in a completely natural way. Those looking to fit a high-quality digital piano into a smaller space need look for further than Casio’s PRIVIA line of pianos. Specifically, the PX-160 utilizes Casio’s acclaimed AiR sound source, which redefines the digital piano experience with more of an expressive and powerful performance quality. In addition, the PX-160 utilizes Casio’s remarkable Tri-Sensor Scaled Hammer Action II keyboard which features simulated ebony and ivory-textured keys for an incredible feel. 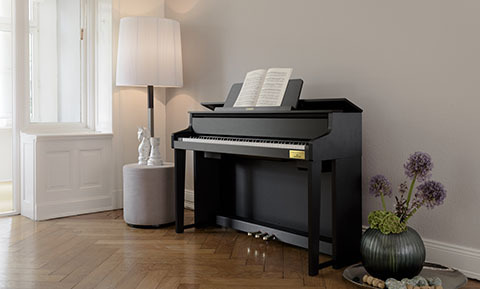 The 88-key digital piano also features an elegant style, with a redesigned dual 8W speaker system. The speaker system is open to the front, but also ported to the back, which provides remarkable sound projected towards the audience. The Privia PX-160 even features left and right 1/4" audio outputs, which makes it easy for musicians to connect to other devices for external amplification or recording purposes. For those players wishing to keep their beautiful music to themselves, dual headphone jacks are included on the front panel of the keyboard. For those seeking high quality piano sound at an affordable price, The CT-X series of portable keyboards feature advanced specifications and the new AiX Sound Source. In addition to piano sounds, the CT-X series faithfully reproduces the appealing sound of acoustic instruments such as guitars, drums, basses, brass, wind instruments, string ensembles and more. Additionally, the CT-X700 includes an extensive library of 600 tones and 195 rhythms, enabling music lovers to celebrate National Piano Month with a wide array of accompanying musical sounds. Additionally, the CT-X3000 and CT-X5000 provide additional tones and DSP editing features, expression pedal inputs as well as more powerful speaker systems. The CT-X3000 has a 6W+6W speaker system and the CT-X5000 has an incredible 15W+15W high-output amplifier delivering powerful sound output for rehearsal or performance applications.